Projections are the most reliable indicator of future performance. There’s room for context, of course, but the best indicator of what a player will do is what he has done. What do fantasy owners do, though, when the models themselves can’t agree? Using Baseball prospectus’ PECOTA and Fangraphs’ ZiPS and Steamer systems, we can find some notable players on whom the computers have differing opinions. Last week, I looked at notable position players who divided the models. I took the slight under on a 20-year-old superstar and bought into a bounceback for a 28-year-old slugger. This week, it’s time for a look at three starting pitchers. Forecasting pitcher injuries is almost impossible. We know that past injury tends to predict future injury, but every pitcher feels like something of a ticking time bomb. Here, though, I’m looking at discrepancies in projected true talent; this isn’t about hypothesizing injury. Where do the models differ on how good a pitcher simply is? One quick note on the systems themselves: Steamer, by nature, is the most conservative of the systems, with PECOTA generally the most bullish. Comparing ZiPS and Steamer, ZiPS forecasts a lower ERA for each of the top ten starters. Fantasy owners are treating Taillon as a solid No. 2. The projections, though, aren’t so optimistic. No system thinks he’ll repeat his 3.20 ERA from 2018. The models might be missing a true breakout. Left-handed hitters have kicked Taillon around throughout his career, with his subpar changeup to blame. In the second half of last season, Taillon finally found that third pitch to complement his mid-90’s fastball and power curve. The changeup never clicked! Instead, Taillon found a power slider in the second half. That pitch finally gave Taillon something to challenge lefties on the inner part of the plate. His 2.33 second-half ERA isn’t sustainable, but a regression to a near-4.00 seems awfully pessimistic. The slider isn’t really a swing-and-miss pitch, though, so PECOTA’s projected strikeout rate feels high. Instead, the real benefit of the added pitch is in contact manipulation. Taillon’s never had problems keeping the ball in the yard, but he challenged hitters in the strike zone last year more than ever. He’s got a friendly home park and a strong three-pitch mix. 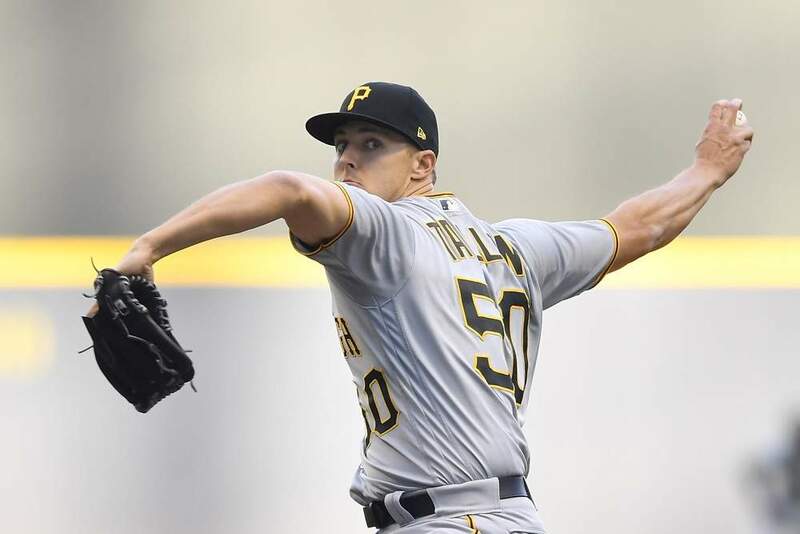 An infield of Josh Bell, Adam Frazier, Erik Gonzalez and Jung Ho Kang isn’t great defensively, so Taillon might give up a few more hits than expected. With superior stuff, though, he shouldn’t be afraid to fill up the strike zone and keep the walks down. Something akin to ZiPS’ forecast seems apt. Corbin’s the rare pitcher on whom Steamer is more bullish than ZiPS. Their projected 0.10 points of ERA seems insignificant on the surface. Consider Steamer’s general conservatism, though, and that projection’s important. Both Steamer and PECOTA have Corbin as a low-end ace, a top-10 type starter. Fantasy owners have been a little more reluctant to buy in, selecting Corbin 15th at the position. ZiPS, meanwhile, thinks Corbin’s squarely a number two, lumping him alongside James Paxton, Jack Flaherty, and Zack Wheeler. Corbin’s wild 2018 season explains his varied projections. His results were never better. Corbin’s strikeout rate jumped nine points from 2017, and his walk and ground-ball rates remained stellar. He leaned fully on his trademark slider, manipulating its shape and velocity en route to a career year. On the surface, it seems that approach may not work long-term; give big league hitters a full offseason to gameplan, and maybe Corbin’s unorthodox approach loses some of its punch. That said, Corbin was just as good in the second half last year as the first. He had no trouble turning a lineup over multiple times. It was apparent early on last year how Corbin was going to mix his pitches. Hitters still couldn’t figure him out. The projections don’t want to buy entirely on such a huge spike in strikeout rate. They don’t know, though, that Corbin so drastically overhauled his repertoire. With strikeout rate continuing to climb league-wide, there’s little reason to think he’ll lose much swing-and-miss next year. Corbin’s 0.68 HR/9 is bound to rise a bit, though. The Athletic’s Eno Sarris found that Nationals Park is sneakily homer-friendly, and the models might have given Corbin a little too much credit for his run prevention last year. The Diamondbacks installed a humidor in Chase Field entering 2018, and the park played much closer to neutral than it has in years’ past. Multi-year park factors might think Corbin conquered a tougher environment than he did. The whiffs, though, are real. Something like PECOTA’s projected strikeout rates with Steamer’s run prevention seems most reasonable. Owners splitting the projections difference and treating Corbin as a high-end number two might be on to something. Digging a little deeper, Lucchesi’s projections stand out relative to his draft position. Fantasy owners are treating Lucchesi as a 4/5 starter, where the models have him more in the 2/3 range. I wrote about Lucchesi at the end of last season, and much of that analysis applies today. Like Corbin, Lucchesi’s ridden a strange pitch mix to results, albeit never to Corbin’s heights. Lucchesi’s ERA last season was inflated by a sky-high home run rate, which the projections are anticipating will come down significantly. I’m not quite so optimistic; Sarris found that Petco Park is better for right-handed power than one might think. As a left-handed starter with subpar velocity, Lucchesi’s precisely the type of arm who would be susceptible to that type of hitter. I’d take ZiPS’ most pessimistic projection, but even that’s valuable. A sub-4.00 ERA with a strikeout per inning plays. Lucchesi should be a top 50 arm in 2019. You buying in on Anthony’s projections? For more great rankings, strategy, and analysis check out the 2019 FantraxHQ Fantasy Baseball Draft Kit. We’ll be adding more content from now right up until Opening Day! Fantrax was one of the fastest growing fantasy sites of 2018 and we’re only getting better in 2019! With multi-team trades, designated commissioner/league managers, and drag/drop easy click methods, Fantrax is sure to excite the serious fantasy sports fan – sign up now for a free year at Fantrax.com.